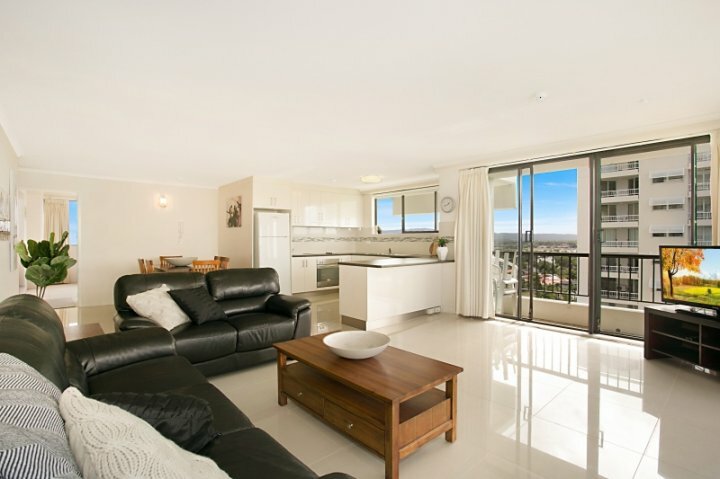 Broadbeach Waters - Large three bedroom/two bathroom apartment with amazing views from every room! Located on the 11th floor in a secure complex with immaculate landscaped gardens, pool, heated spa, tennis court, sauna & bbq area. This spacious renovated apartment is fully tiled (except bedrooms). The main living area has a wrap around balcony which has beautiful North/East facing views of the Surfers Paradise & Broadbeach skyline. It features a flat screen TV & open plan kitchen with a dishwasher, microwave, fridge, oven. In the main bedroom there is a queen bed, ensuite, balcony, ceiling fans & built in robes. Also has fantastic views towards the hinterland & out towards the ocean. The second bedroom has great views with queen bed, built in robes & a ceiling fan. The third bedroom has two single beds, built in robes & ceiling fan. The main bathroom has a step in shower also with great views & is combined with the laundry & features a washing machine & clothes dryer. This lovely apartment is the perfect place for your next Gold Coast family holiday located within a 5 minute walk to Pacific Fair shopping centre & approximately 20 minutes walk to the patrolled beaches & restaurants in the centre of Broadbeach. Lovely landscaped gardens with heated spa, children"s wading pool, lagoon style pool, sauna, bbq facilities, tennis court, table tennis & manicured gardens make this the perfect place to stay. Secure parking for 1 car.